Sharks are the most important predators found in oceans across the world. But it is a poorly known fact that sharks are also found in freshwater habitats in some countries. There are six species of river sharks found in the world, out of which the Ganges shark (Glyphis gangeticus) is endemic to India. It inhabits the River Hooghly in West Bengal, as well as the rivers Ganges, Brahmaputra, Mahanadi in the states of Bihar, Assam and Orissa. While some of the other river sharks are also known to inhabit saltwater, the Ganges shark is only found in rivers and possibly estuaries, with no confirmed records from oceans or seas. It is amongst the 20 most threatened shark species and is listed as a Critically Endangered species in the IUCN Redlist. Belonging to the family of requiem sharks in the order Carcharhiniformes, it has a stocky greyish brown body, with a broadly rounded snout and small eyes. Unlike other members of this family, the eyes of the Ganges shark are tilted dorsally, instead of laterally or ventrally, indicating that it may swim along the river bed scanning the waters above for prey. Though its feeding habits are unknown, its sharp and slender teeth suggest that it is primarily a fish-eater. Adults grow to about 178 cm in length and give birth to live ones. It is often confused with the bull shark, which is known to attack humans. Its population has been steadily decreasing due to over fishing, habitat degradation, increasing river utilisation, and building of dams. Its fin and jaws are in high demand in the international trade, and is also fished by locals for its meat and oil. Recognising the dangers faced by this species, it is protected under Schedule I, Part II A of the Wildlife (Protection) Act of India, 1972. 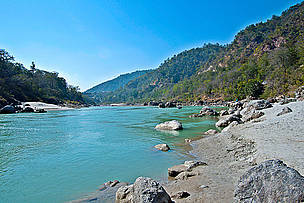 The Ganga is one of the rivers in which the Ganges shark is found.